At first, there was some confusion as to the location of the photograph, which looked a bit like London. 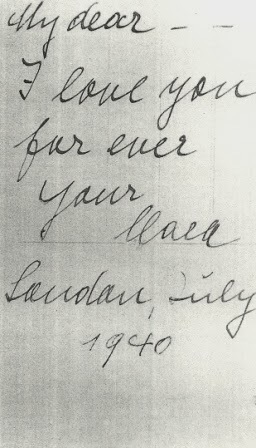 Further research by MI5 and consultation with an expert in German affairs determined that the handwriting was German and that the location was Landau (a city in southwestern Germany) and not London. When questioned about the woman in the photograph, Josef told a story that changed a bit over time. Josef arrived in Hamburg on September 22 and stayed at the Reichshof Hotel. He often visited the Cafe Dreyer and enjoyed the music of the Bernhard Etté Orchestra and one of their lead singers, Clara Bauerle. Josef and Clara became quite friendly and on October 26, at her request, he moved to the Sorgenfrei Hotel, where many of her orchestra friends were staying. Clara was staying in a private apartment in the Hansaplatz but intended to move in with Josef after her upcoming tour. Clara had been the mistress of the Medical Officer of a U-boat flotilla in Kiel and Josef now admitted that she was his mistress. Clara and the orchestra left Hamburg on a tour which took them to Leipzig, Dresden, Forst, East Prussia and Berlin. On November 7, Josef phoned Clara in Forst and set up a meeting for when she was in Berlin. The orchestra was in Schöneberg, Berlin from November 18-20 and at the Neue Welt in Hasenheide, Berlin from November 23-24. Josef presumably met Clara at one of the Berlin engagements as he traveled to Berlin on the weekends to visit his family and November 23-24 was a weekend. He also introduced Clara to his wife, Margarete, perhaps at one of the performances of the orchestra. Clara returned to Hamburg on November 25 and moved in with Josef at the Sorgenfrei Hotel. Clara and Josef often dined at the "2n den Gaststätten" restaurant and the "Alstereck" restaurant. During November and December, Josef began to take English lessons at the Berlitz School in Hamburg. Clara took some lessons as well after she returned to Hamburg at the end of November. When Josef left Hamburg in early January, Clara was still there, but on January 21, he received a letter which said that she was very ill and had been sent to hospital. Josef knew that the orchestra was supposed to be in Hamburg in March 1941 but had had no further word of Clara's condition. 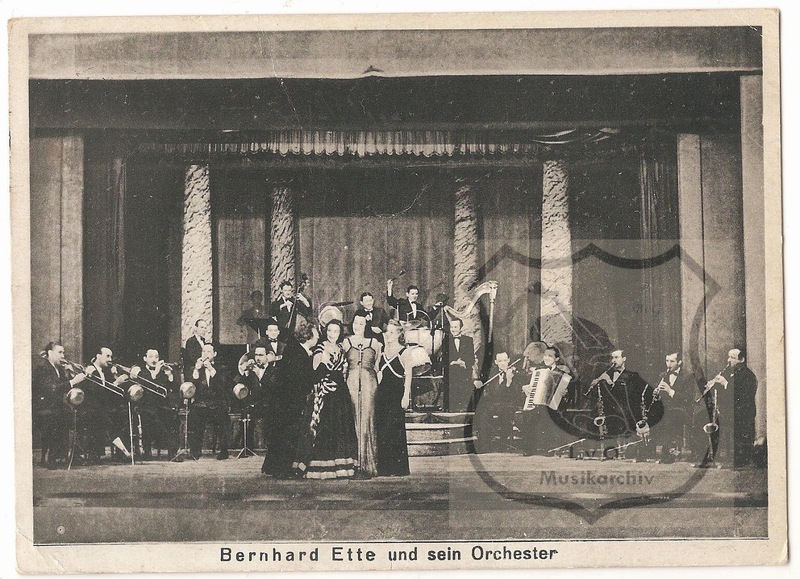 Initially Josef said that he introduced Clara to Dr. Beyer (Boeckel) who got her a gig entertaining the troops, where she earned more money than with the Etté Orchestra. 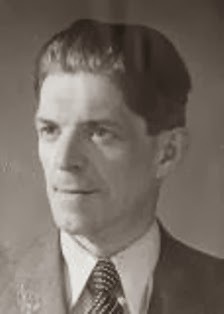 Josef said that Clara knew of his connection with the German Intelligence Service.Later, in July 1941, during a conversation with fellow spy Karel Richter, Josef mentioned that the Major in The Hague had told Josef that Clara would be sent over to join him. In July 1941, officers of MI5 interrogated Josef about Clara and learned that had Josef's mission succeeded, Clara would have been sent over to help him. She was being trained in Hamburg to use the wireless set. However, as Josef had been unable to send news to Hamburg, he doubted that she would be sent to England. MI5 searched their files and requested searches of the Home Office files. The only possible match for Clara Bauerle was a certain Klara Sophie Bauerle, a German born on June 29, 1906 in Stuttgart. This woman had arrived in the United Kingdom on 10 or 20 of October, 1930, and left Warwickshire for Germany at some unknown date. The Central Register of Aliens had been notified of her departure on 21 June, 1932. There was no evidence that this Klara had ever visited England again. Whether this particular Klara Sophie Bauerle was the same person as the Clara Bauerle that Josef knew was questionable. Josef said that Clara always spelled her name with a "C" and he was quite certain that she had never been to England before. He was also quite certain that she had been born in Ulm, a city in southwestern Germany near Stuttgart. 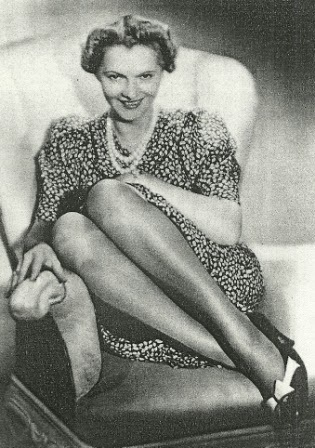 When asked why the photograph said "Landau, July 1940" when Josef said he had only met her in October, Josef said that Clara was a capricious woman and was always giving him picture postcards of herself with various dates. Interestingly, Karel Richter, another Abwehr spy, had met Josef and Clara several times in Hamburg. In Karel's opinion, Josef was mainly interested in his affairs with women but Karel thought Clara was a large, not very good-looking woman. Karel never spoke to Clara but recognized her later because of her "tallness". On September 3, 1939, England declared war against Germany. 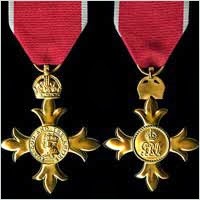 On September 5 of that same year the English Parliament, with Royal Assent, passed a National Registration system. With war declared, evacuations looming, and the last census eight years old, the government wanted to know who lived in England and how to keep track of them. On the evening of September 29, 1939, a national registration took place of all people in the United Kingdom. The National Registration system was instituted by Sir Sylvanus Vivian, the Registrar General from 1921 to 1945. 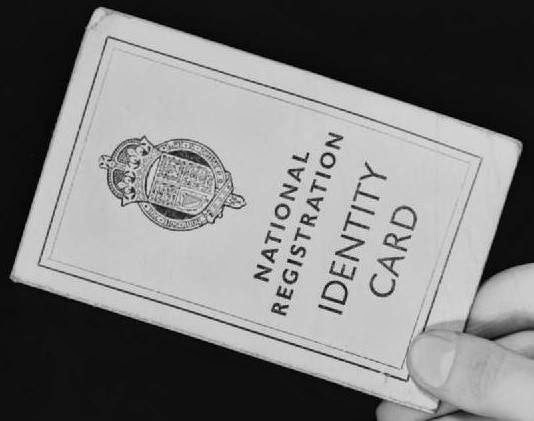 The National Identity Cards that were issued as a result of the registration were also coupled with ration books which were introduced in late 1939 or early 1940. 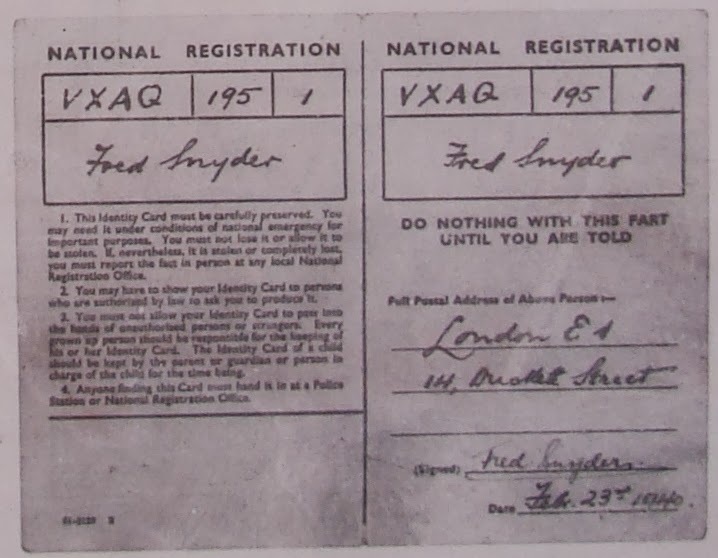 In order to receive rationed goods, everyone needed a ration book and a National Identity Card. People also needed to carry the cards at all times. The identity card was not a complicated document. Today, we would laugh at that sort of document being used for identification purposes. The identity card listed the person’s name and registration number. Later, after 20 May 1940, people were told to write their addresses on the right part of their identity card and to sign it. National Registration Identity Card from Wikimedia Commons. The registration numbers were fairly basic as well, a four letter code, then a number, followed by another number. The four letter code was a district code, similar to an enumeration district. The next number was a household number. The final number was the person’s position within the household. So, AKAZ/145/3 would mean the district code AKAZ, Household 145 and person #3 in the household. Identity cards had to be carried at all times and needed to be presented when using ration books. The cards could be demanded by police, air raid wardens and members of the Home Guard, particularly when traveling on the train. While the registration cards were quite simple in apperance, that simplicty was crucial for the "checking" system, of which Sir Vivian was particularly proud. When presented with a dubious card, an officer could ask the bearer for their birth date so that it could be checked against the central registry. Since the date of birth was not listed on the card, the bearer would either have to know the information or make a wild guess. The card's simplicity was so effective in this regard that Sir Vivian was able to resist proposals to make the card more complex by adding a photograph. On the evening of January 31, 1941, as he was boarding an aircraft bound for England, Josef Jakobs was handed a British Identity Card by a Major Merkel. Josef was told to sign the card as James Rymer. The identity card given to Josef by the Germans was a forgery, and not even a very good one. Even a cursory glance by a Home Guard volunteer or a police constable would have raised questions about its authenticity. 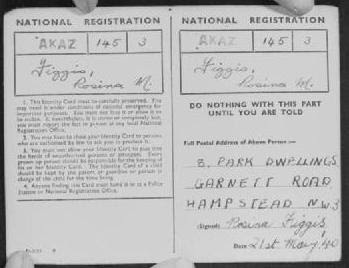 National Registration Number - The registration number on Josef's Identity Card was 656/301/29. It should have been four letters/number/number. Handwriting - On a genuine card, the address was filled in after May 1940 and should have been in a different handwriting, using a different pen. Folding - Josef's forged card was machine folded - genuine cards were folded by hand. It turned out that the information on Jakobs' Identity Card had been provided to the Germans by double-agent SNOW on 12 December, 1940. The Germans had requested the names and addresses of people whose houses had been destroyed by bombs. There was a James Rymer who had lived at 33 Abbotsford Gardens, Woodford Green and who had been bombed out sometime between 29 October, 1940, and 12 December, 1940. 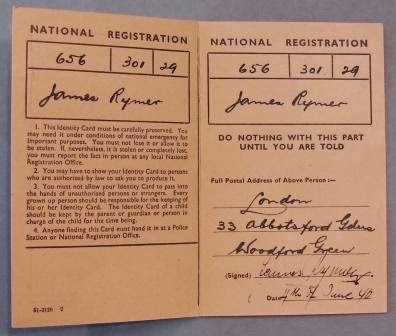 SNOW also sent Rymer's genuine registration number to the Germans: ARAJ/301/29. The number on Josef's card was virtually identical to the code sent by SNOW except that the four letters had been replaced by the numbers 656. Several MI5 officers wondered why the Germans would have altered the genuine registration number. Another German agent, Karel Richter, was captured near London Colney in Mary 1941 and carried an Identity Card in the name of Fred Snyder. His card contained the same errors as Josef's card in terms of name format, handwriting, address format and folding. While the National Registration number followed the correct format - four letters/number/number - it turned out that VXAQ was an impossible code since none of the letter codes started with the letter "V". In fact, the code had been sent over by SNOW on 10 August, 1940. In addition, Richter's card was signed on 23 February, 1940, which was wrong, as the cards were only to be signed after 20 May, 1940. Karel Richter's forged Identity Card - photographed at National Archives by G.K. Jakobs. In hindsight, it is clear that the German agents had extremely inadequate identification papers. The German Secret Service, in providing these forged identity papers were relying on information provided by "their" agents in England. They thought the information was genuine, little realizing that all of "their" agents had become double agents and were working for MI5. Agar, Jon. Identity cards in Britain: past experience and policy implications. History & Policy, accessed 6 January 2014. Copyright (c) G.K. Jakobs, 2014. Wandsworth Prison opened its doors in 1851 as The Surrey House of Correction. It was constructed using a modified "Panopticon" design with a central hub from which four wings radiated. Initially 700 prisoners were housed at Wandsworth each in an individual cell with toilet facilities. Eventually the toilet facilities were removed to make room for more prisoners. In 1878, after the close of Horsemonger Lane Gaol, the gallows were transferred to Wandsworth Prison. 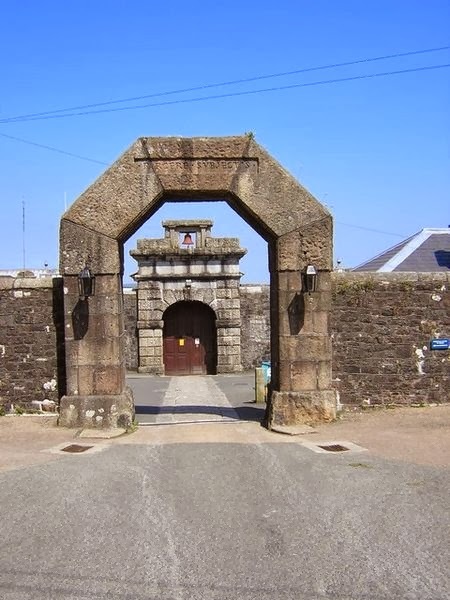 Initially executions took place within a purposely built execution shed on the prison grounds. In 1911, a new execution facility was built between E & F wings next to the condemned cell. Finally, in 1937, a new execution suite was constructed in E Wing spanning three floors. The top floor contained the beam from which the chains hung. The middle floor contained the execution room with the trapdoors and the lever. The ground floor cell opened out to the yard for easy removal of the body. 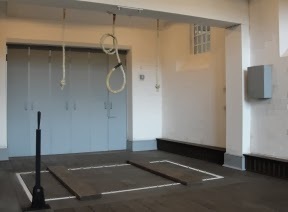 In 1965, Britain abolished the death penalty and eventually, in 1994, the gallows at Wandsworth were dismantled and sent to the Galleries of Justice in Nottingham. They gallows last been used in 1961 but had been tested every 6 months as they could have been required for someone accused of treason or piracy with violence. In 1998, hanging for even those offences was abolished. 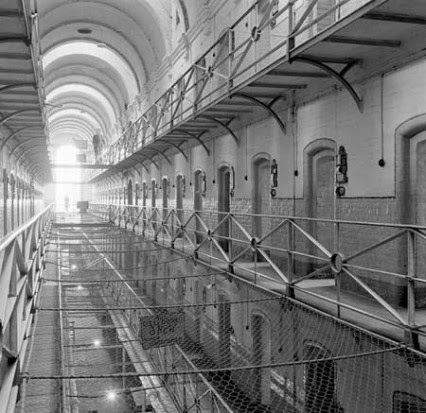 In 2006, E Wing , which contained the former execution room and the condemned cells, was completely gutted and reconstructed. Nothing remains of those former times. Prior to the reconstruction of the wing, a TV crew from the series Off the Beaten Track managed to get a tour of the condemned suites and the former execution room. It is a fascinating video. During World War I, Robert Rosenthal was hanged at Wandsworth Prison for spying under the Treachery Act of 1914. The remainder of the spies were executed by firing squad at the Tower of London. During World War II, 17 spies were condemened under the Treachery Act of 1940. Nine of these men were hanged at Wandsworth Prison, including Karel Richter. Seven were hanged at Pentonville Prison. Josef Jakobs was the lone spy to be executed by firing squad at the Tower of London. 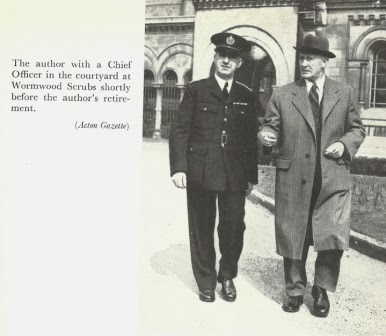 Josef was transferred to Wandsworth Prison from Latchmere House on July 23, 1941. He was housed within one of the condemned cells, separated from the rest of the prison population. A squad of military police guarded him around the clock as he was a military inmate. In fact, his cell was temporarily deemed to be a military prison. On August 4 and 5, Josef was tried by court-martial and found guilty. His sentence was death by firing squad. On August 6, two German spies who had also been found guilty of espionage, Karl Drucke and Werner Walti, were hanged at Wandsworth Prison. On February 1, 1941, Josef Jakobs was discovered in a field at Dovehouse Farm near Ramsey, Huntingdonshire. Josef had suffered a broken ankle during his descent by parachute from a German aircraft. Unable to move, he summoned help by firing his pistol into the air. Two farmers found Josef that morning and notified the Home Guard. Josef was transported to the Ramasey Police Station in a horse-drawn cart by members of the Home Guard. Upon arrival at the police station, Josef was examined by Inspector Horace Jaikens who summoned Dr. Willem Hertzog, the local doctor. Dr. Hertzog confirmed that Josef had a broken ankle. Later that day, Hertzog certified that Josef was in a fit condition to be transported to London. Willem Hertzog was born on 29 July, 1903, in Jagersfontein, in Orange Free State, South Africa. 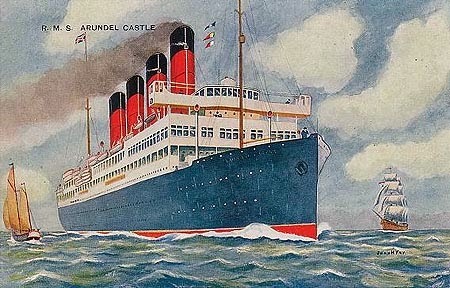 In 1924, Willem embarked from Durban, South Africa on the mail boat Arundel Castle. 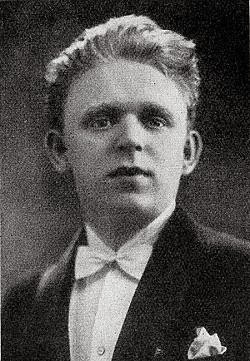 On April 21, 1924, Willem arrived at Southampton, England and began his career as a student. On October 19, 1928, Willem departed Southampton for Cape Town on the Kenilworth Castle, presumably to visit his family. Willem listed England as his country of permanent residence. On January 14, 1929, Willem traveled back to England, arriving in Southampton again on the mail boat Edinburgh Castle. Willem studied medicine and, in 1932, obtained his LMSSA (Licentiate of Medicine & Surgery of The Society of Apothecaries) at Guy's Hospital Medical School. Willem was registered to practice medicine in England on May 1, 1933. In 1934, Willem married his wife Elfreda Margaret Curtis in London. By 1935, Willem and Eldreda had moved to Ramsey, Huntingdonshire, where they lived in The Gables, a historic dwelling dating from the 1200s. Willem and Freda had three children, one of whom also went on to become a doctor. Willem served as a general practioner in Ramsey for many years, finally retiring in 1968. Willem and his wife spent a lot of time maintaining and improving their medieval-halled house and gardens. Willem passed away on 12 December 1991 in Ramsey. He was 88 years old and survived by his wife and three children. Willem's wife Eldreda passed away in 2003 at the age of 91. According to an obituary published in the British Medical Journal (BMJ) in 1992, Willem Hertzog was proud of his South African roots. He was a compassionate, thoughtful man, courteous at all times. 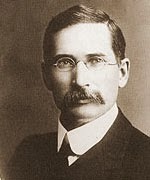 Willem's uncle was James Barry Munnik Hertzog, a lawyer who served as Prime Minister of South Africa from 1924 to 1939. A biography of James B.M. Hertzog notes that he was a descendant of German immigrants, Johann Barthold Hertzog and Susanna Maria Jacoba Hamman. Johann Barthold Hertzog may have come to South Africa in 1734 from Braunschweig, Germany. It is interesting to note that Willem Hertzog, a South African descendant of German immigrants, eventually ended up treating an erstwhile German spy in the village of Ramsey, Huntingdonshire. When Josef landed near the village of Ramsey on the evening of January 31, 1941, he had a map in his possession which caused quite a stir with the local authorities. A penciled circle and a cross marked the locations of two Royal Air Force Bases. The cross marked RAF Upwood and the circle marked RAF Warboys. Area around Ramsey & Warboys. Red star marks RAF Upwood. Blue star marks RAF Warboys. While both air bases have long since been decommissioned, their association with Josef Jakobs, would-be German spy, is still remembered. Sean Edwards maintains two websites, one devoted to RAF Upwood and one devoted to RAF Warboys. The website devoted to RAF Upwood contains a section on Josef Jakobs. Much of the information comes from Stephen Stratford's website which outlines Josef's court martial and has been reviewed here. The RAF Upwood site does contain a bit of extra information regarding Josef's arrival and capture at Dovehouse Farm. A map shows the location of Dovehouse Farm in relation to Ramsey. A similar map can be obtained via www.streetmap.co.uk. This extra information on the RAF Warboys site is accurate. The site also makes mention of the map in Josef's possession which highlighted the locations of the aerodromes at Upwood and Warboys. This website was only uploaded in 2012 and is still under construction. Construction on RAF Warboys began in 1940 and the airfield was ready for use in July 1941, several months after Josef had landed. While this website makes no particular mention of Josef, it is interesting to know that the Germans may have already had information on the airfield even before it was put into use. Former location of RAF Warboys - southwest of village of Warboys. A couple of good websites with quite a bit of information on the history of RAF Upwood & RAF Warboys. 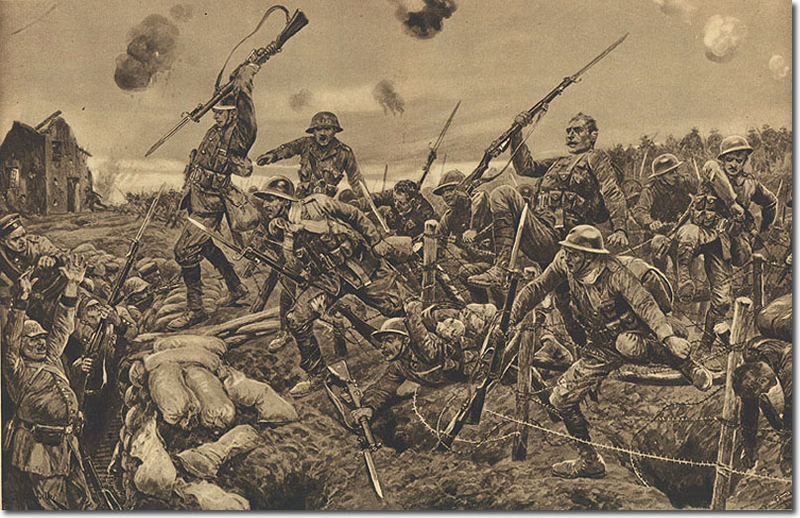 The information provided on Josef's court-martial is based on Stephen Stratford's site which contains a few errors. The introductory paragraph on Josef is accurate.